Chicken is replacing beef as America's go-to meat: According to the U.S. Department of Agriculture, the average American consumes about 82 pounds of chicken per year compared to 54 pounds of beef. While chicken contains less saturated fat and cholesterol than beef, it can be just as expensive if you limit your purchases to boneless, skinless chicken breasts. A whole chicken roasted on the grill is both economical and healthy; it's also simple, with almost no hands-on effort required during the cooking time. 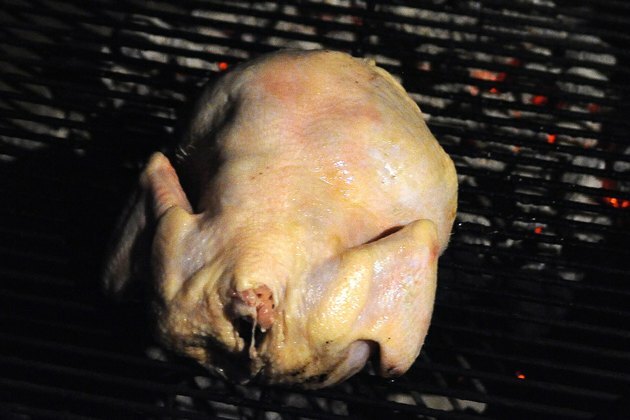 Before roasting a whole chicken on your Weber grill, check the manufacturer's instructions. Preheat a gas grill to 500 degrees Fahrenheit or a charcoal grill until it is too hot for you to hold your hand 3 inches above the grate for longer than two seconds. 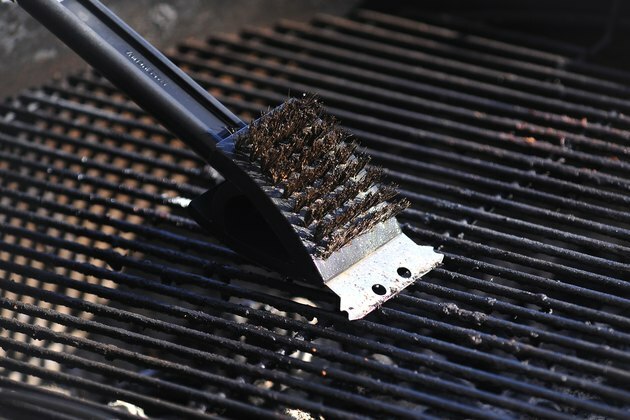 Use a wire grill brush to clean the grate as thoroughly as possible. Adjust the temperature settings on a gas grill for indirect medium heat, checking with the manufacturer's instructions for specific directions. 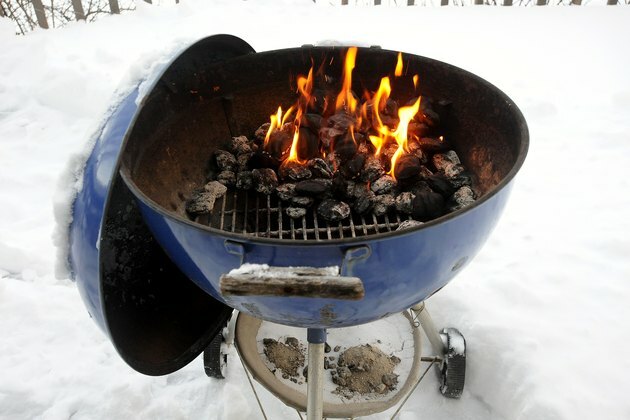 For a charcoal grill, you can create indirect heat by piling the charcoals on one side of the grill, so you have a hot side and a cooler side. Wash the chicken under cool, running water. Remove and discard the bag of gizzards contained in the chicken's cavity. Brush the entire outside surface of the chicken with olive oil and sprinkle it generously with salt and pepper. Season the inside cavity of the chicken, adding fresh herbs such as sage or tarragon, if desired. Tie the chicken's legs securely together with butcher's twine. Cut off any excess twine. Brush the grill's grate with a light film of oil. Place the chicken, breast-side-up, in the center of a gas grill or to the cooler side of a charcoal grill. Close the lid and allow it to cook for 1 1/4 to 1 1/2 hours. 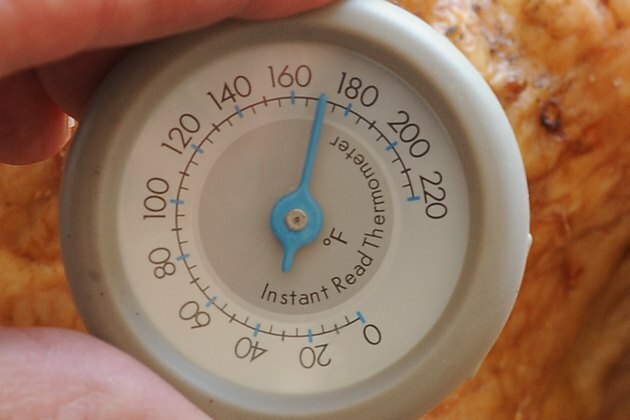 Insert a meat thermometer into the thickest part of the chicken's thigh to check that it has reached an internal temperature of 170 degrees Fahrenheit. 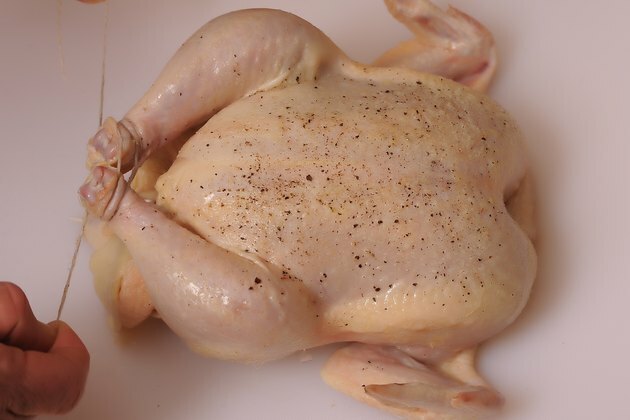 Place the chicken on a cutting board or platter and allow it to rest, undisturbed, for 10 minutes before serving. 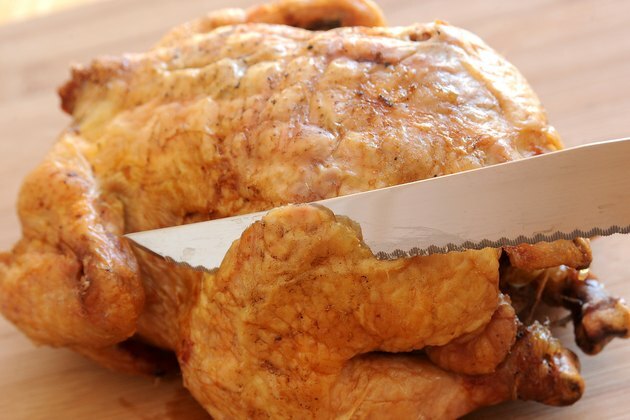 To reduce the cooking time, use a knife or kitchen scissors to remove the backbone and press the chicken flat, skin-side-down, so that it is butterflied open before seasoning it and placing it on the grill. 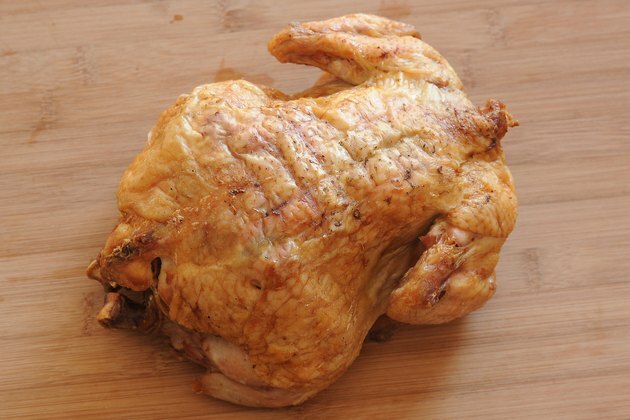 A whole chicken butterflied in this manner should take between 50 and 60 minutes to grill, says Better Homes and Gardens food editor Jan Miller. Always use a clean plate and clean utensils for cooked chicken. Do not attempt to reuse the plates or utensils you used with the raw chicken unless you have thoroughly cleaned them first. Avoid using a barbecue fork to handle grilled chicken. Piercing the meat allows the accumulated juices to drain out of the chicken.